Spectacular views are par for the course on Norway’s snow-capped Gaular Mountain. 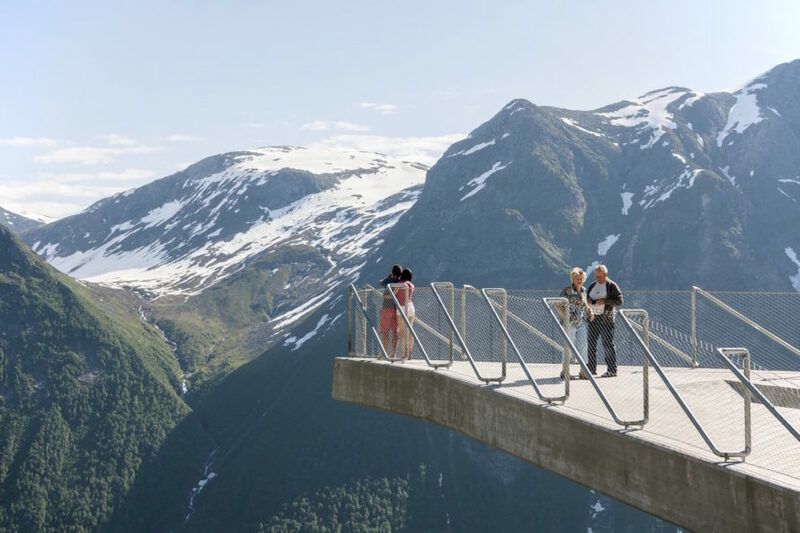 Enjoying those vistas is now even easier thanks to the recent completion of Utsikten, a triangular viewpoint perched at a vertiginous point with breathtaking panoramic mountain views. 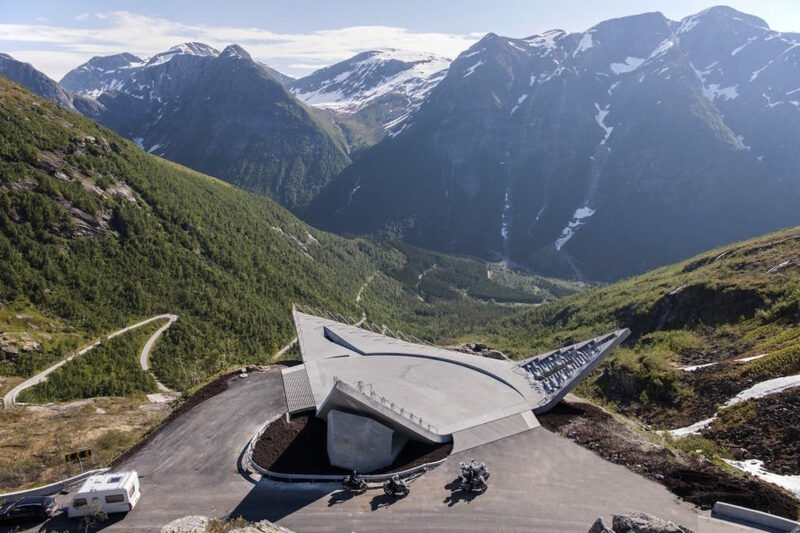 Designed by Oslo-based studio Code Arkitektur, Utsikten is powered by solar energy and features upturned edges that give the concrete rest stop a starship-like appearance. Utsikten—Norwegian for “The View”—is located near the top of Gaular Mountain following an ascent of hairpin bends. The viewpoint was constructed almost entirely of concrete with an 80-centimeter-thick platform and raised, wing-like corners that point towards the north, south, and west. “Each corner is shaped specifically in relation to the landscape and to different use,” write the architects. “It has been an object to create a shape that stimulates physical movement, and also can work as an arena for cultural events.” Solar panels that provide all the necessary energy for the platform are installed on the west corner. Given the remote and challenging location, Utsikten was meticulously designed with physical and computer models before it was installed in phases. The finished platform creates a clean and precise shape in the landscape that will gradually soften over time as the concrete weathers and natural vegetation grows along the sides. Rails made from thick steel pipes and inconspicuous nets have been installed for safety. Seats are carved into the upturned wings. A small bathroom is tucked below. Utsikten—Norwegian for “The View”—is located near the top of Gaular Mountain following an ascent of hairpin bends. The viewpoint was constructed almost entirely of concrete with an 80-centimeter-thick platform and raised, wing-like corners that point towards the north, south, and west. Solar panels that provide all the necessary energy for the platform are installed on the west corner. Given the remote and challenging location, Utsikten was meticulously designed with physical and computer models before it was installed in phases. The finished platform creates a clean and precise shape in the landscape that will gradually soften over time as the concrete weathers and natural vegetation grows along the sides. Rails made from thick steel pipes and inconspicuous nets have been installed for safety. Seats are carved into the upturned wings. A small bathroom is tucked below.